Thank you friends for your wishes on my Birthday. Your wishes made my day. I got few gifts from my hubby and friend. The day was good as my hubby was on leave although my son and me had cold. I wanted to make something simple and quick. I prepared Microwave Low Fat Carrot/Gajar Halwa without ghee and cashews. I don't use microwave except for heating and making papads. First time I have tried this Carrot Halwa and it came good. Forgot to add Bachelor's out there you can also try this. Remove and add condensed milk and raisins mix n keep it for 3-4 mins. Till the carrot is well cooked. Mix and serve the hot Carrot Halwa with Ice cream. You can also try my normal version of Carrot Halwa here. You can use only condensed milk instead of sugar. Timings will vary according to the microwave. So check while doing accordingly. If you feel the carrot is not cooked you can cook for 2mins more. Cool idea,never tried this in microwave,thanks for the recipe! 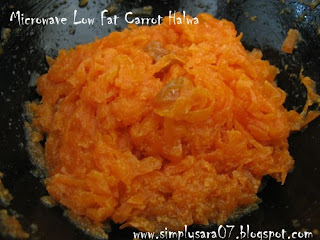 Droolworthy carrot halwa, looks wonderful..
Looks like a yummy, healthy dessert. lovely lowfat version of carrot halwa!! belated mny mny happy returns of hte day,..halwa looks yum,. Belated birthday wishes to you. Gajar ka halwa looks delicious.